It would be impossible to write about Procol Harum without mentioning A Whiter Shade of Pale. This was the song with a distinct Bach flavour to it which was undoubtedly the making of the band as far as wide public recognition was concerned. It also had its drawbacks, however, in that many people identified them by this sound and expected all their music to be in the same vein. The group's follow-up to Whiter Shade was Homburg, which was also a Top Ten hit. Like all the tracks on this record it was written by Keith Reid who is a talented, original and much under-rated lyricist. 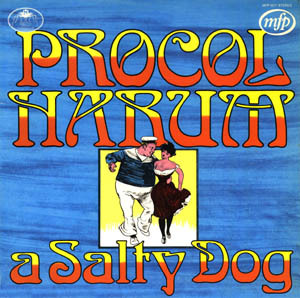 Listen to the broad selection of titles on this album, which features pianist / vocalist Gary Brooker, and you will soon realize that Procol Harum has progressed far beyond the style of A Whiter Shade of Pale. Thanks to Dave Lee, who submitted this. He adds: I reckon there were other Procol compilations in the 1970s that had the same tracklisting, but I can't remember precisely.